Of all the makeup products available in the market, mascara has got to be one of the most popular and most loved of them all. It’s an essential product for a lot of people and for a good reason. Regardless of the look, you’re aiming for (natural to full glam to a touch of goth), mascara works for your look every time. Most people don’t even feel like their makeup look is complete without a swipe of mascara on their lashes. For many, mascara brings out the more confident and fearless person inside them. While mascara is incredibly beloved by makeup lovers and beauty gurus, there are people out there that can’t wear mascara without getting their eyes irritated, itching, and red all over. Not exactly a flattering makeup look on anyone. That’s right, for ladies with sensitive eyes mascara is a tricky product to use. So what’s a gal to do then if mascara causes such a reaction? Throw away every bottle of mascara and swear never to touch the stuff ever again? Well, actually you can spare yourself that heartbreak because there’s actually a simple enough solution: hypoallergenic mascara. When you’ve got sensitive skin especially around your eyes, finding a mascara that has the right formula is especially important. You need to avoid certain ingredients that can irritate your skin. Lucky for you, we’ve listed our top 10 best hypoallergenic mascara and, if you stick around some more, we’ve even discussed the advantages to wearing hypoallergenic eye makeup as well as some makeup tips for sensitive skin. This isn’t any other regular mascara out there, ladies. For starters, this mascara is made of non-toxic and hypoallergenic ingredients specifically catered for those with sensitive skin so your lashes will be as bold and beautiful as you want them to be. But hold on, Mia Adora’s 3D Fiber Lash Mascara’s friendly formula is just the tip of the iceberg. As its name suggests, this mascara is unlike most mascaras where you only apply the product to your lashes. 3D Fiber Lash Mascara is actually a three-step process that consists of two different tubes of product. The first tube is a magnifying gel which you can actually use by itself since it’s like normal mascara (but where’s the fun in that?). The second tube is the fiber tube that lengthens and volumizes your beautiful lashes. Undoubtedly, Mia Adora 3D Fiber Lash Mascara has changed the game for the better. And its safe for easily irritated eyes too! What a score! Drugstore mascara can seriously damage your lashes, especially if you’re the sensitive type. This hypoallergenic mascara, however, nourishes your lashes while making your eyes pop. Who says that you can’t have both beautiful and healthy lashes? Easy on the Eyes, Hypoallergenic Mascara is made from natural ingredients like chamomile (for healthy lashes), beeswax (for stronger lashes), and even rosemary (for longer lashes. It’s even waterproof and non-clumping. If you’re looking for a mascara to really get that bold and dramatic look, Reviva Labs is for you. Its hypoallergenic formula makes it a perfect go-to mascara if you’re in a hurry or if you just need something to make your eyes pop. This gentle mascara has fibers that promote better growth on your lashes. It’s also tear proof and can thicken your lashes without you having to deal with those nasty clumps that are, unfortunately, common in other less reliable brands. Give Reviva Labs a try, and you won’t regret it! This simple-looking tube of mascara actually has quite the cult following. W3LL People Natural Expressionist Mascara not only has all natural and organic ingredients that are gentle on sensitive eye areas, but it is also ridiculously pigmented too. Your lashes will immediately look luscious and luxurious with its pure mineral pigments. W3LL PEOPLE is also a brand that is 100% cruelty-free and is formulated with powerful organic botanicals. Any makeup lover worth their salt should be quite familiar with L’Oreal Paris. It’s a beloved brand that a majority of people know and trust. So naturally, their hypoallergenic mascara is up to quality as well. Their Bare Naturale Mineral-Enriched Mascara nourishes as well as beautifies so you’ll benefit from it before and after you apply them on your lashes. 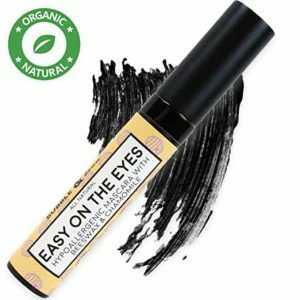 This mascara has Vitamin E, aloe vera, and jojoba oil, so it’s quite obvious why it has so many health benefits. The formula is natural and gentle, so you’ll never have to worry about using it too much or for too long. You are looking for a full coverage mascara that can last you all day while also being gentle on your eyes and lashes? Well, Ere Perez Natural Avocado Mascara can give you all of that and more! This mascara’s organic formula can nourish as well as fortify your lashes. It uses a careful selection of plant extracts (like avocado), oils, and minerals so the mascara won’t irritate your eyes at all. In fact, this mascara is compatible with all skin types, not just sensitive skin. And, even better news, you can rest easy knowing that this brand doesn’t test their products on animals. If you’ve got a long day ahead of you and you need a mascara that won’t fade or smudge after so many hours, Ere Perez Natural Avocado Mascara is a perfect choice. This mascara doesn’t use harsh chemicals like parabens, propylene glycol, and paraffin, so you don’t have to worry about damaging your lashes no matter how long you keep the mascara on. Almay is a brand that’s well known for creating makeup specifically for sensitive skin. It’s well loved by the community not only for their hypoallergenic products but also for their affordable prices. Their One Coat Nourishing Mascara is one of their high quality yet budget-friendly products that anyone with sensitive skin ought to try. As its name suggests, you only need one coat of this mascara to get fuller, curvier, and longer lashes. It’s downright magical how your lashes are transformed after a quick swipe with this product. Definitely a mascara you should always keep in your purse. You never know when you need to touch up your makeup look in the middle of the day. Almay One Coat Nourishing Mascara will make it so much easier for you to amp up your glam in a snap. Here’s another 3D fiber lash mascara for you to check out. Long and Luscious 3D Fiber Lash Mascara is actually used and recommended by famous celebrity makeup artists, so you know that this mascara means business. When you’ve got sensitive eyes, extensions or falsies can be a major pain to deal with. This 3D Fiber Lash Mascara is hailed as one of the best alternatives to false eyelashes. No matter how short or fine your natural lashes are, with this 3D mascara, you’ll see a dramatic improvement in length and volume. Better still, your drastically fuller lashes will still look natural and completely real. Clearly, this option is better than gluing on extensions or falsies. You don’t have to feel the weight of those artificial lashes or worry about them peeling off in the middle of the day. Most importantly, Long and Luscious 3D Fiber Lash Mascara has all natural ingredients. It uses green tea from Japan and China as well as a selection of minerals and elements that are safe for your sensitive skin. The fibers used are also completely natural. You’ll definitely get your money’s worth with this mascara kit. Not only does it include a tube of gel mascara and a tube of 3D fibers, but it also comes with a lash comb, an instructions and tips sheet, and a hard protective case where you can safely store your items. If you’re serious about your mascara game, you likely already know about Mirenesse Secret Weapon 24HR Mascara. It’s considered as the holy grail of mascaras! And for a good reason too. It’s hypoallergenic, water-based, completely smudge proof, flake-free, and is genuine 24-hour wear. That’s right, ladies, 24 hours! You can sleep with this mascara on and won’t have to deal with staining on your pillow. Mirenesse prides itself with a mascara formula that doesn’t use toxins that are found in a lot of mascaras. Instead, it has exclusively nourishing ingredients such as organic waxes that protect your lashes from damage. It also has panthenol to promote lash growth as well as proper hydration. Most mascaras are oil based which makes them waterproof but also melts on your lashes over time, accumulating in the lash roots if you’re not careful. Mirenesse Secret Weapon 24HR Mascara is water-based, so it’s safer and easier to remove. You only need to soak a cotton pad with warm water and gently pat on your eyes until the mascara slides off. Not only is this mascara compatible for those with sensitive eyes, but oily skin babes will also love this formula. Last but definitely not least, we’ve got for you the best natural mascara you can buy. Skin2Spirit is a natural mascara that works fast and stays put the entire day. The hypoallergenic formula is silky smooth, free from toxic chemicals, and tear resistant. Its ingredients are botanical and organic, so you can trust this mascara to keep fallout at bay. If you want thicker and longer lashes without having to risk them looking fake, Skin2Spirit Mineral Mascara is your go-to product. You can even build up more volume if you want. Just wait until the first coat is dry and layer on another until you’re satisfied. And if you need a liquid eyeliner, this mascara can be used for that purpose too! Its formula is so gentle that you can apply it on your waterline without irritating your eyes. By now you already know that some skin types are more easily irritated by certain ingredients (often chemical ingredients) than others. Sensitive skin people are prone to getting an allergic reaction or irritation whenever their skin is introduced to a toxin or chemical that don’t generally affect other skin types. Hypoallergenic makeup – this includes hypoallergenic mascara and hypoallergenic eyeliner – uses specific ingredients that are safe to use on sensitive skin. Hypoallergenic makeup has really revolutionized the makeup industry over the years. It has allowed people with normally sensitive skin to wear makeup without having to suffer allergic reactions. Way, way back, people with sensitive skin would have to either accept that they just can’t wear certain types of makeup (or at all) or power through despite the redness and itchiness that the products cause. Now there are so many hypoallergenic makeup products to choose from that no one will be left out. Hypoallergenic mascara, in particular, is a heaven-sent creation especially because a vast majority of people actually are quite sensitive around their eye area. It might take some time to find the right mascara for you but, with persistence and a little bit of luck, you’ll find the perfect one for you for sure. As earlier mentioned, many women actually do get some allergic reaction when it comes to eye makeup. Even some who don’t consider themselves to have sensitive skin can sometimes experience irritation whenever they put on mascara or any type of eye makeup. So what’s the deal with that? Well, there are several factors that possibly played a role in causing sensitive eyes. If you’ve all of a sudden found your eyes tearing up or turning red whenever you apply a coat of mascara or eyeliner, check out these possible causes and see which one is the most likely culprit. Once you’ve narrowed it down, you can then take the right steps preventing further sensitivity on your eyes. If for some reason you’ve injured your eye recently, the chances are that you’ll experience blurred vision along with redness and watering. Naturally, if the injury is major, you need to seek immediate medical attention. Take off your contact lenses if you suspect an injury on your eyes and avoid wearing eye makeup until you’re sure you’re fully healed. If any liquid substance enters your eyes, wash it off immediately. If the redness or irritation doesn’t subside, you’ll want to seek professional help before it worsens. Allergies are actually a rather common cause, especially when the seasons change. Watery and itchy eyes are a common symptom of allergy so wearing anything on your eyes while your allergies are in full blast is not a good idea. What’s more, is that you can actually develop allergies even if you’ve never had a problem with it in the past. If you move to an entirely new location or if your body’s immune system changes somehow, you’ll likely suffer allergies. The good news is that you can control your allergies before they control you with an over-the-counter antihistamine. If it’s not so bad, you can ride them out. But if you’re planning on wearing makeup, you’ll probably want to take preventive measures. Did you know that our eyes are one of the most sensitive parts of our body? It’s exposed and, for the most part, quite vulnerable, so it’s no surprise that it’s the organ that is the easiest irritated. A chemical or ingredient that might not necessarily cause problems on your skin might have a drastically different effect when exposed to your eye area. Hypoallergenic eye makeup is generally a great idea for anyone, regardless of their skin sensitivity. Foundation, concealer, or any other face makeup are easy to get away with, but eyeliner or mascara is close to your eyes, so there’s always a risk of a negative reaction. Better safe than sorry, as they say. Even when you’ve tried countless makeup products in the past, there’s still a chance that you’ll have an allergic reaction to a certain product. Makeup, if you can recall, is full of preservatives, fragrances, and other chemical ingredients that your body may not be compatible with. Eye makeup especially should be handled with caution. Here are the signs to look out for in cases of an allergic reaction. The first tell-tale signs of an allergy is an itchy rash. If you see any small bumps around your eye area after removing your makeup, the chances are good that the eyeshadow or mascara you used is to blame. It’s best if you avoid using that specific makeup in the future. In the meantime, make sure the area is clean and avoid scratching the bumps at all costs. You don’t want to irritate the area any further. This is the more severe reaction than rashes. Of course, a swelling is hard to ignore when it’s around your eyes since it’s one of the most noticeable parts of your face. The skin around your eyes are also delicate, so any type of swelling is immediately noticed. When it’s only mild swelling, you can just wait for it to go away on its own, but if it’s severe and shows no signs of dying down any time soon, you might need to apply a cold compress on your eye. Check with your doctor if the swelling gets really bad. Probably the most serious allergic reaction if your mascara, eyeliner, or eyeshadow is not hypoallergenic. You’ll know if you’ve got allergic conjunctivitis when your eye area starts itching and your eyes start watering. Redness is also observed, and there can be even a thick discharge. In some severe cases, photosensitivity can be experienced which is when your eyes become especially sensitive to light. If you experience these symptoms, remove your eye makeup immediately. Make sure you wash and clean your eye area as thoroughly as possible. Worst comes to worst, you might have to call in a doctor’s appointment. Lastly, here are some additional ways you can make sure that your sensitive eyes don’t get irritated when you’re a makeup lover. Do a patch test before committing to the mascara or eye makeup. This is generally a good practice if you’ve got sensitive skin. Instead of applying an unfamiliar brand of mascara on your lashes immediately, try the formula somewhere else like on your inner forearm. Cover the patch test with a bandage and give it a day. If by the end there are no signs of irritation, that mascara is likely safe to use. Stay away from a waterproof mascara. Yes, a mascara that won’t smudge or streak sounds like a great idea, but you have to consider that this type of product is much difficult to remove. They’re typically not advised on sensitive eyes since you’ll have to really scrub your skin to get them off. Simplicity is beauty. If your eyes are especially sensitive, you might want a mascara that has a simpler and gentler formula. Sure you might not get the most volumizing or thickening mascara but, at the end of the day, you’ll avoid irritating your eyes at least. Always, always, always remove your makeup before going to sleep. No matter how long your day was, no matter how tempted you are to conk out the moment you get home, never forget to take off your make up and wash your face. Leaving a face full of makeup on is just asking for trouble, especially if you’ve got sensitive eyes.